Paige Morgan is the Digital Humanities Librarian at the University of Miami. Before joining the University of Miami she held a CLIR Postdoctoral Fellowship at the Sherman Centre for Digital Scholarship at McMaster University in Ontario. She completed her PhD in English and Textual Studies at the University of Washington, where she developed the Demystifying Digital Humanities curriculum with Sarah Kremen-Hicks and Brian Gutierrez through a grant from the Simpson Center for the Humanities. Paige’s research interests include data modeling for humanities subjects, linked open data, social infrastructure for digital scholarship, emotional labor in tech contexts. 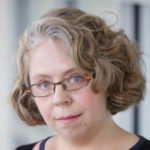 She has served as a consultant and data wrangler on a variety of projects, including the CLIR microgrant project Identifying Early Modern Books (IdEMB). She teaches workshops and short courses on DH at training events such as DHSI and DH@Guelph. You can find her writing on topics related to digital humanities and libraries, as well as 18th and 19th century English poetry in journals such as Romanticism, Romantic Circles, and DH+Lib.